I’m convinced little boys are magnets. Pint-sized, powerful dirt magnets. I’m constantly going through wet wipes. In the house. In the car. In the store. Everywhere. There’s not a dust bunny, dirt speck, or food particle within a good mile radius that does not find it’s way onto their person. And by person, I meant their face, hands, shirt, etc. You name it, if they’ve been awake for 5 minutes, something has found them. Knowing this, I’m always armed with some handy-dandy wipes to scrub them down on the go. That leftover kool-aid mustache? Check. The hands that are now black from tracing every wall we’ve walked past for 5 minutes? Check. About a year ago, I started to notice how many wipes we were going through and how the cost was really adding up. Being the fastidious penny-pincher that I am, I began to look for a way to make my own that were not only cheaper, but just as durable. Only a strong wipe can compete with my grubby boys and keep them as presentable as humanly possible until bath time. A friend of mine with a gaggle of her own children told me about this recipe that she swore by. I tried it, and from the very first swipe I was hooked! As I’ve mentioned before, Son #4 struggles with eczema. We’re dealing with a very itchy bout of it now. These wipes are gentle enough to even use on his super-sensitive skin. Not only do they not cause any reaction or irritate his condition, they even seem to help soothe his itching. That alone would have sold me on these. 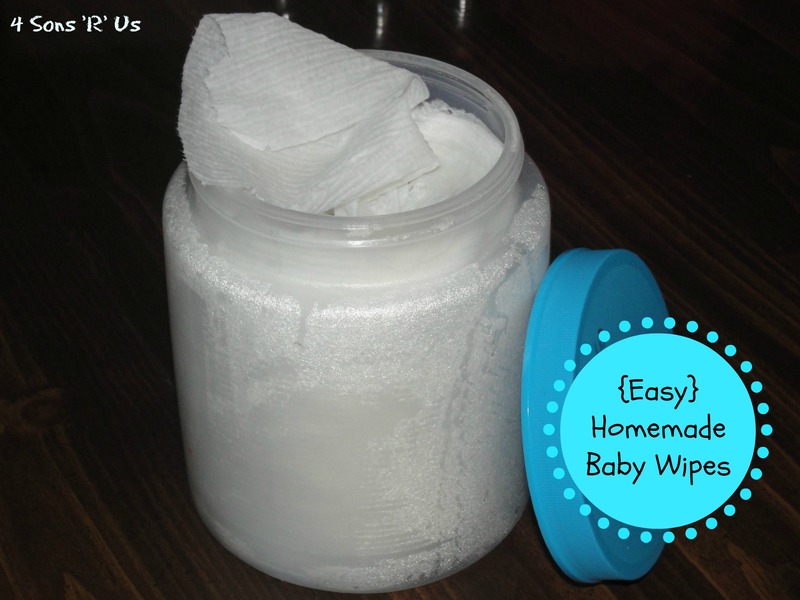 One of the best things about these all-natural, homemade baby wipes is that they do not contain alcohol and are super gentle on those delicate areas, especially if you’re dealing with diaper rash. The tea tree oil, as well as the coconut oil have anti-microbial properties and protect against molding. Also, both the tea tree oil and coconut oil provide a multitude of skin benefits. Start making your own wipes today. They blow all the store-bought competition out of the water. And, they’re cheaper! These, my friend, will totally ‘wipe’-out and reservations you may have. Cut the roll of paper towels evenly in half. It will resemble two rolls of toilet paper at that point. Carefully remove the cardboard paper tube from inside the paper towels. In a bowl, mix the baby wash, oil, hot water, and 2-3 drops tea tree oil until evenly combined. Pour the mixture into the wipes container. Add the cut paper towels and let sit, for about an hour, until all the mixture has been soaked up and saturated throughout the towels. To use, pull wipes from the center.